And the midnight message of Paul Revere." What did Paul Revere's famous midnight ride from Boston to Lexington sound like in April 1775? If you were there, you might recognize the approaching horse as a Narragansett Pacer mare. This once popular breed of horse, now extinct, was known for its ambling gait: a smooth riding four-beat gait that is faster than a walk, but slower than a canter or gallop. You might also notice the calm surroundings interrupted occasionally by crow calls, trees rustling in the wind, or the occasional farm dog barking at the stranger barreling down the rough dirt road. Just someone in a hurry. I wonder how Henry Wadsworth Longfellow heard it in his head in 1860? Longfellow brought the nearly obscure ride by Revere into the public consciousness with his poem "Paul Revere's Ride." For impact, he glorified the ride with creative license and literary tools to warn that our country was about to fall apart (it did with the Civil War). I would think that those hoofbeats were probably a bit louder and more urgent in his mind. What about you? Now that you know the significance of that ride, can you hear the thundering hoofbeats, the snorting horse, the jingling bridle, and Revere snapping his reins and kicking his heels into the giant beast's sides? Maybe Tim Burton or JJ Abrams has influenced your imagination. We've been conditioned by Hollywood to "hear" history differently from what it probably really sounded like. Guiding the listener is the cornerstone of sound design, so a movie about the famous ride might have those hoofbeats sound more explosive than truthful. In the end, it may be worthwhile if we simultaneously entertain and bring light to Revere's contributions to the Revolution. Liz Covart, host of the podcast "Ben Franklin’s World" and Digital Projects Editor at the Omohundro Institute of Early American History and Culture in Williamsburg, VA wondered in a blog post: how authentic should sound designers be with history? She points out that our environment is much different than it was 250 years ago. We have paved roads, differently constructed buildings, powered transportation, industry, and many more people. With the majority of Americans living in urban areas today (6% in 1800, 80% in 2018), our perception of a quiet night is quite different than Paul Revere's. We modern Americans also have a collective naïveté of what a galloping steed on a dirt road would really sound like because we have replaced horses with horseless carriages. If there's one thing I've learned about sound design, it's that real sounds of life sound really lifeless. Like Liz Covert, I would also ponder accuracy while telling Paul Revere's story with sound. Do I record a pacer's ambling gate on a deserted country road? Hopefully I could find someplace free of airplanes, cars, machinery, and other people. (I wrote about the rarity of quiet places in one of my A Sound Education articles). Or maybe I take the Hollywood route and have the ride sound larger than life? I think it depends on the audience. If it's a room full of scholars who delight in historical accuracy, then go with the pacer. If it's a cinema full of families with popcorn and Jujubes, then go with the thunder. Or maybe a pacer mixed with thunder...but let's not overthink this. Speaking of horses, here's a real-world example of blending authenticity with impact. I worked for several years on the crew for the Triple Crown Radio Network. We broadcast the three legs of the Triple Crown (Kentucky Derby, Preakness Stakes, and Belmont Stakes), and the Breeder's Cup races. One of our challenges was how to add excitement to the sound of the race. We had to do much experimentation within boundaries and rules to find the right sounds of each race. For instance, we were not allowed to mount a wireless mic on a horse of jockey to catch the sounds of riding. We were also limited to how many mics we could use trackside to capture hoofbeats. 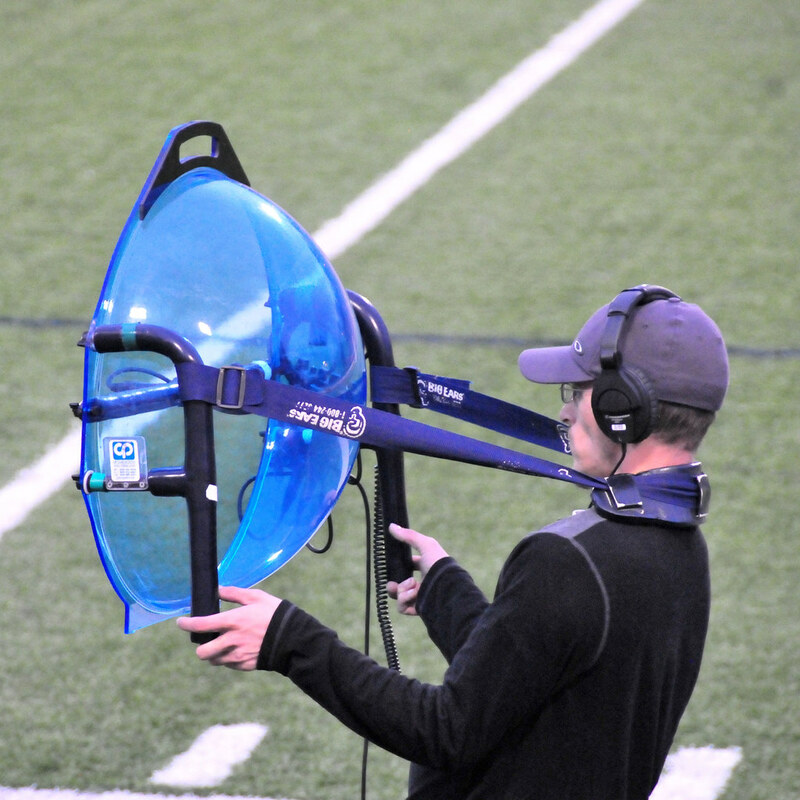 We tried a parabolic mic (those big dish-looking contraptions on the sidelines of a football game), but the sound was thin and the track too large for complete coverage. What we ended up doing – and this is like finding out how a magic trick is done – was to pre-record hoofbeats at each track under a variety of conditions, and then blend those into the mix. We were very keen on keeping the race sounding as organic as we could. We installed several supercardioid shotgun microphones along the stretch run of each track and recorded races over several days. We would then layer a few of these and create an endless audio loop for that particular race track. We were also very careful to have different loops for different track conditions, so if it was raining and sloppy, we had that distinctive sound for that racetrack. When the race began, our mix engineer would subtly blend in the looped sound underneath live microphones we already had installed around the track. As the horses came down the stretch to the finish line, he would fade out the loop and fade in the trackside boom microphones for the authentic live sounds of hoofbeats, whips, and jockey shouts. This was the sound of real live thundering hooves making history.